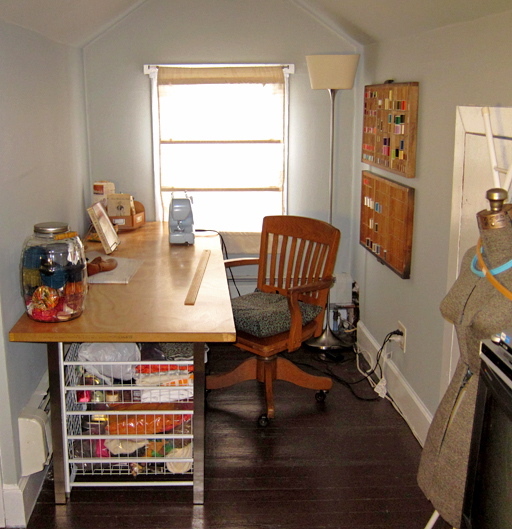 I'm so excited about my new and improved upstairs studio space! It's divided into two -- one area is for all of my art/painting materials, and the other is for sewing and yarn and such. 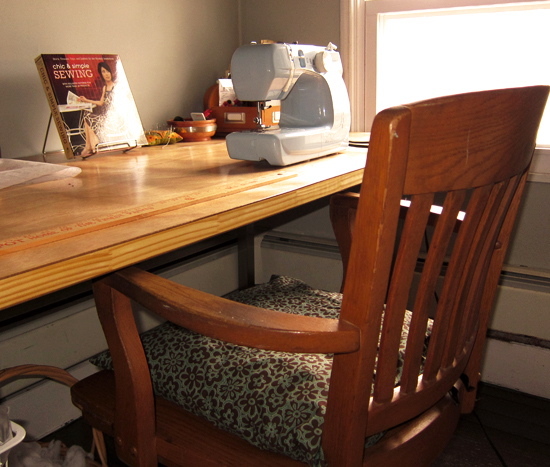 The table is made from a solid-core Jeld-Wen interior door from Home Depot, carefully sanded and varnished by M. on the top. The legs are from IKEA. It's a huge surface, providing ample space for laying out and cutting patterns. Antique printers' trays on the back wall hold spools of thread, both vintage and new. I bought the dress form (currently sporting a few embroidery hoops on its neck) at an indoor flea market in New Milford, CT, and the wooden chair was salvaged from someone's cast-offs in the neighborhood. 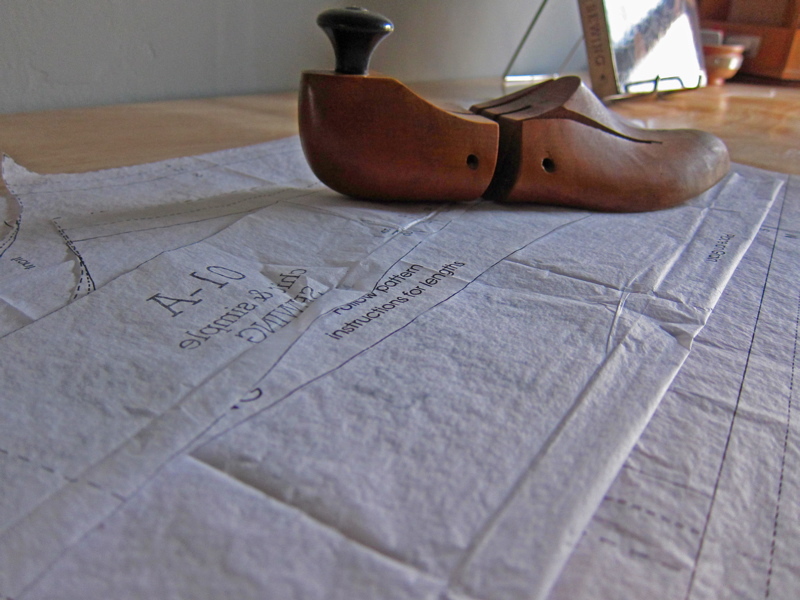 Since pattern pieces can fly off in a breeze if the window's open, I use a vintage shoe-stretcher as a paperweight. 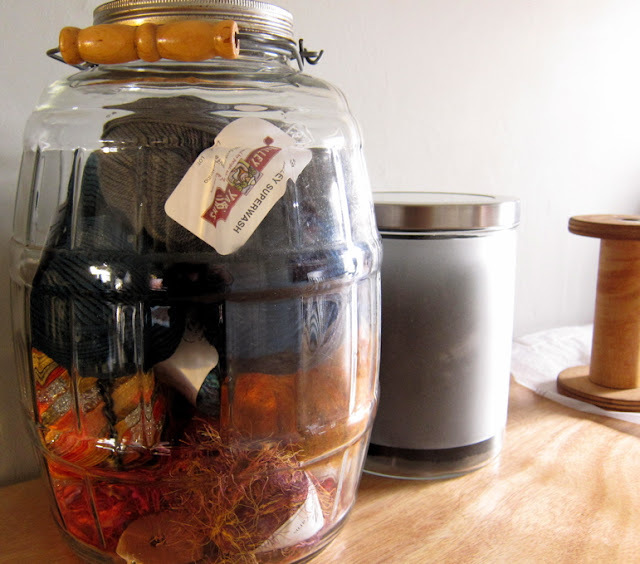 Yarn is corralled in an old pickle jar, picked up on a trip to the Brimfield Antique/Flea Market. Looks yummy, no? Hope to find another like it sometime. 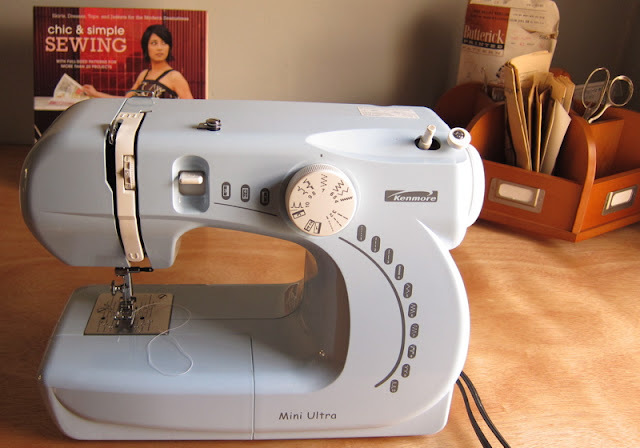 My sewing machine is nothing fancy -- just a Kenmore Mini-Ultra I've had for nearly 10 years. The polygonal wooden thing behind it is a Pottery Barn Kids desk carousel, for scissors, notions and random vintage patterns. 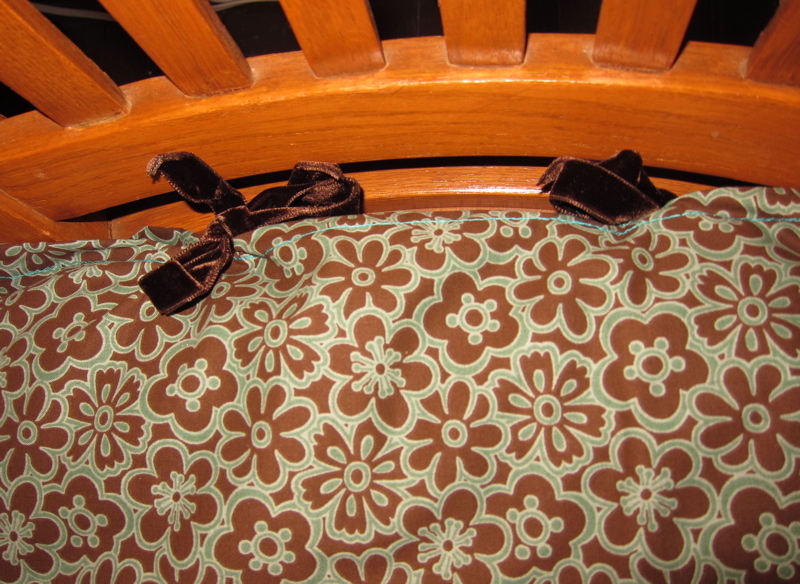 My first project post-studio-reno was the little seat cushion for the chair, with brown velvet ties. I'm hoping to make a matching sewing machine cover (was inspired by this project from blogger Six One Seven) from the remaining fabric. Just next to the little sewing alcove is a television (I do love some Cooking Channel), which sits on this vintage thread cabinet. At least that's what I think it is -- anyone know for sure? 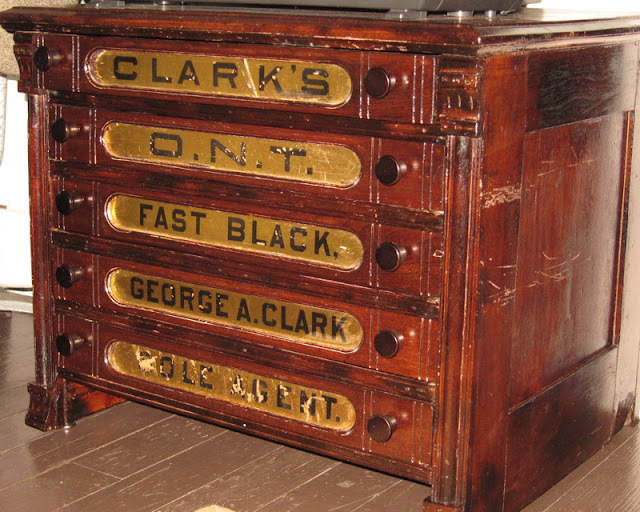 From a quick Internet search, I think it appears to be promoting Clark's "Our New Thread" Fast Black and probably dates from the late 1800s or early 1900s. Anyway, not sure of the exact provenance of this piece, but I can tell you we got it from a yard sale at the home of none other than the now-governor of Connecticut, Dan Malloy. In the next post, I'll show you the art/painting half of the space, directly opposite.